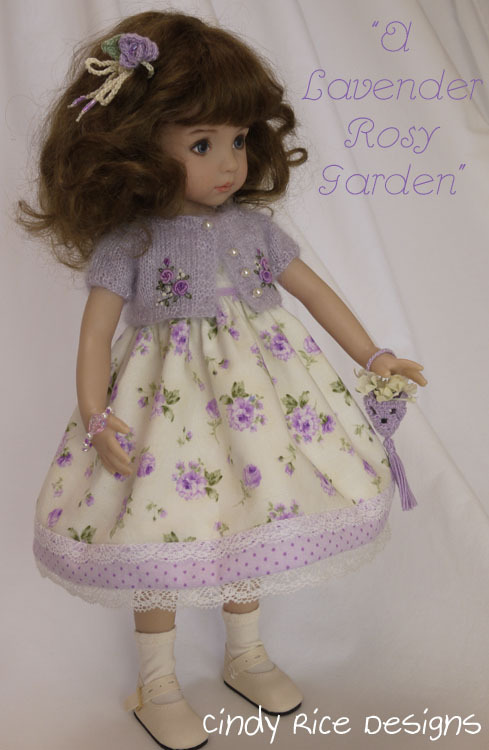 I am someone who loves the purples–lavender, lilac, violet, purple, plum, orchid, mauve (although I got burned out on this last color in the 1980s) and I am someone who loves roses, so this new ensemble for the Little Darlings practically created itself. Just kidding, of course. Jeanne, at the blog, I Dream of Jeanne Marie, started creating a yummy lavender dress for American Girl dolls a couple of weeks ago and looking at her pretty lavender outfit got me itching to make something in this shade right now too. I have this rose fabric in four shades and two of them are purples. This rose print reminded me of my grandma’s pillowcases that she always used. I wrote about that here. Here is Patience’s rose dress made from this fabric in a red violet shade. This lavender print is a bit bluer than Patience’s ensemble. It was a bit tedious getting both rows of lace to line up perfectly, but I am happy I took the time to get it perfect. The double rows of lace make this ensemble dressier, I think. I knit the sweater out of lace weight mohair/silk and embroidered two mirrored image motifs on the front. For more information on this ensemble for the Little Darlings, please visit my “Available for Sale” page at cindyricedesigns.com . 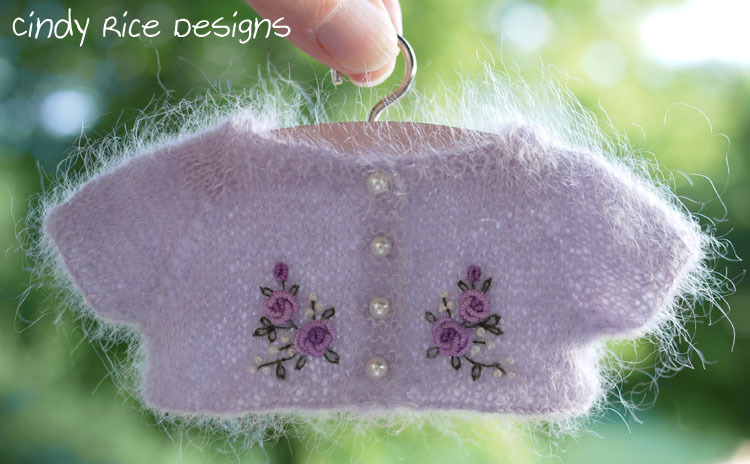 This entry was posted in Doll Dresses, Effner Dolls, Embroidery, knits, little darlings, Sweaters and tagged cardigan, doll dress, doll sweater, effner, embroidery, floral print fabric, little darlings on June 22, 2015 by Cindy Rice. Cindy – All the attention to detail in your work is amazing! The lavender is lovely! The color choice seems to be the perfect match for the doll too! Hi Heather. Thanks so much for your comments. I agree, this color is great for her skin tone. In person, she looks great wearing anything, but the camera does strange things with skin tones. All the finest fabrics and lace weight mohair silk that make up this beautiful ensemble, are to perfection. Gina is a darling little model for all the ensembles. I can’t wait to receive this very special package. I cannot wear animal fibers, but the dolls can, so I knit for them. Thanks for your comments. All the finest fabrics and lace weight mohair silk that make up this beautiful ensemble, are to perfection. Gina is a darling little model for all the ensembles. I can’t wait to receive this very special package. Thank-you, Cindy!